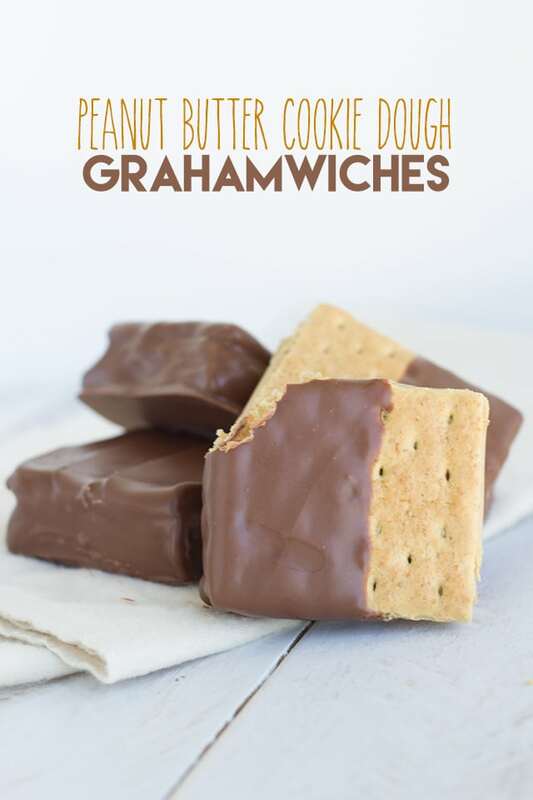 A simple, but oh-so-delicious peanut butter cookie dough stuffed graham cracker sandwiches. Welcome to another month of #PeanutButterBash. 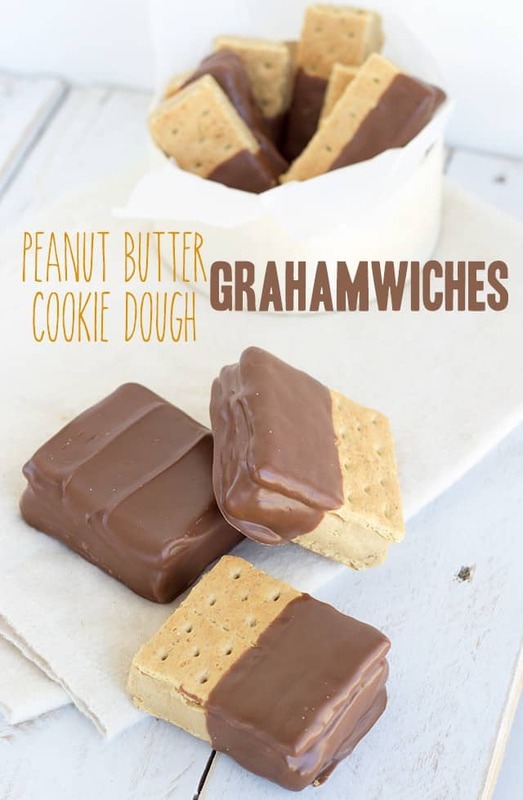 Today’s addition are peanut butter cookie dough grahamwiches. I am so proud of myself for coming up with “grahamwiches.” If someone else has said it before, please don’t ruin it for me. Just let me feel a little creative. This month for the Peanut Butter Bash our theme was graham crackers and peanut butter. What an amazing combination, if you ask me. As a child, I would just dip graham crackers in peanut butter. Being that I’m an adult now, I had to take one of my favorite childhood snacks to the grown-up level. If you didn’t know, today is Nation Peanut Butter & Jelly Day. If you want to get in on some peanut butter and jelly recipes, here is my peanut butter jelly fudge and at the bottom all the other pb & j recipes from last month. Back to these peanut butter cookie dough grahamwiches. They are so simple to make. Get your graham crackers, cookie dough, and candy melts ready. You’ll have treats ready within the hour. I love the addition of the chocolate candy melts for a few of reasons. First, the chocolate can seal the deal which will help keep the graham crackers fresh. That’s if you completely cover them. Secondly, they keep everything together in a nice little package. Nothing will be falling off in transit. Thirdly, peanut butter and chocolate. That is all. Break the graham crackers in half. Try to apply even pressure so they break along the line. In a mixing bowl, add in the butter and peanut butter. Beat with a hand mixer until incorporated. Add in the brown sugar and vanilla and beat on high until light and fluffy, about 2 minutes. Scrape down the sides. Add in the flour and mix on low to avoid a flour shower. Once almost all the flour is incorporated, turn the mixer on high and beat until the flour is combined. Scoop a pile of cookie dough in the center of the cookie. Press it out to the edges and add the top cracker. Using a butter knife, even out the edges by removing the excess and press any cookie dough into missing spots. My grahamwiches were quite thick. Once all 15 grahamwiches are made, set them aside. 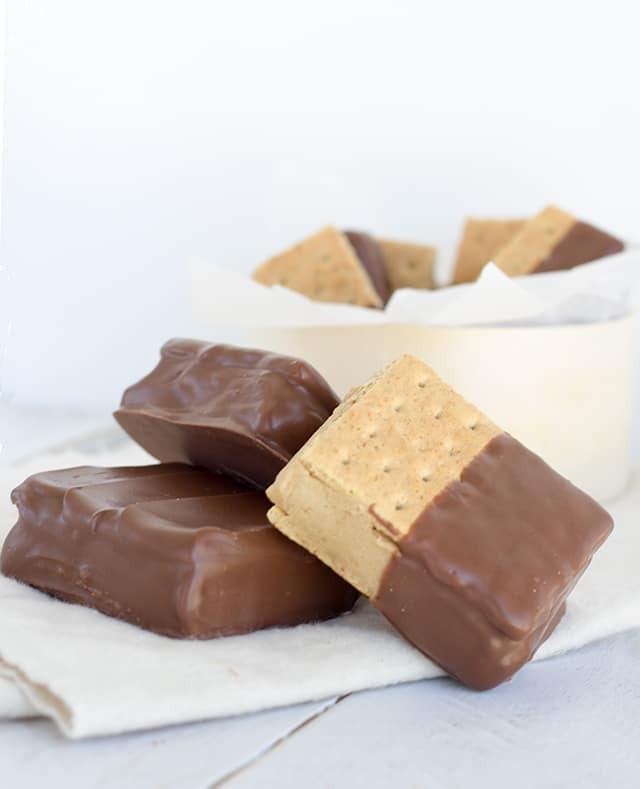 Place the chocolate candy melts and shortening in a microwave-safe bowl. Microwave for 30 seconds and then stir. Repeat the microwaving and stirring 3 more times to completely melt the chocolate. 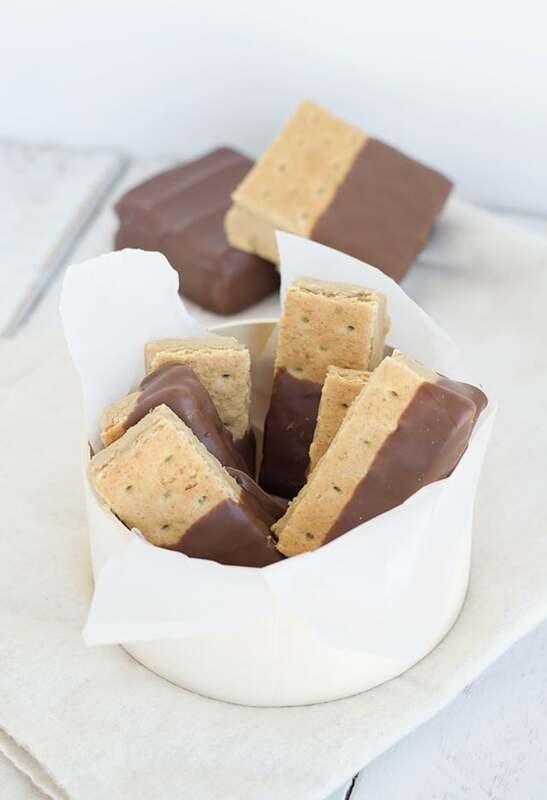 Lay out a piece of parchment paper for the dipped grahamwiches to dry on. Dip the grahamwiches completely or partially in the chocolate. Tap the wrist of the hand holding the grahamwich to help get the excess chocolate off the grahamwiches. Place each grahamwich on the parchment paper to dry. It will take 20-30 minutes. After they're dried, place in an air tight container to keep fresh. We’ve had so many friends want to join us as non-bloggers, that we’ve started a peanut butter sharing group for all! 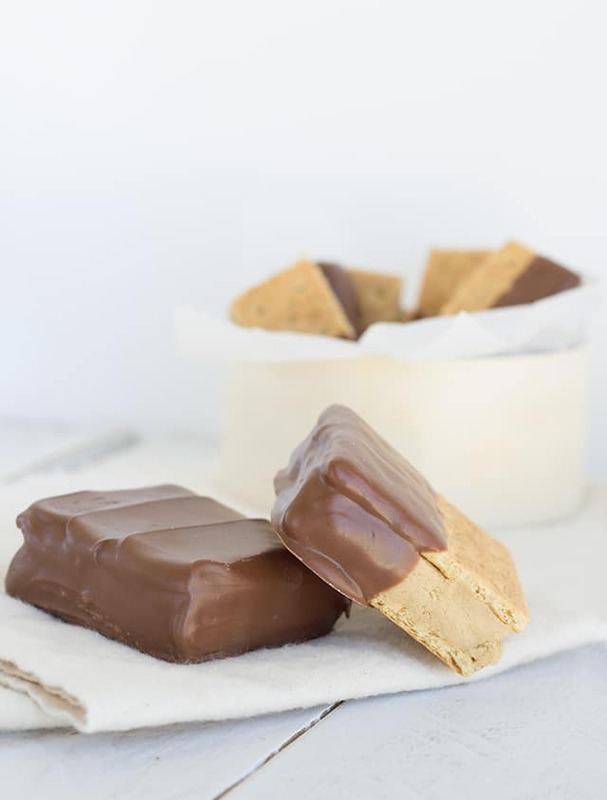 Join us at The Peanut Butter Recipe Box on Facebook. Bloggers, do you want to join in on the peanut butter bash fun? If so, email me at [email protected] and request to join the Peanut Butter Bash facebook group! The first Thursday of each month we post a dessert/sweet with peanut butter and a mystery ingredient. This month’s ingredients were peanut butter and graham crackers. Here are the other peanut butter and graham cracker creations! I am so going to be making these for my kids. They look just so good! I love peanut butter! Thank you, Stephanie! They are insanely tasty. Let me know how your kiddies like them! Love this idea. They look fantastic! What a fun way to make cookies! I love the way they look too. 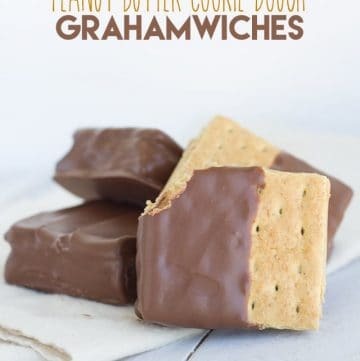 And graham crackers are one of my not-so-secret addictions, so this is right up my alley. Thank you, Laura! 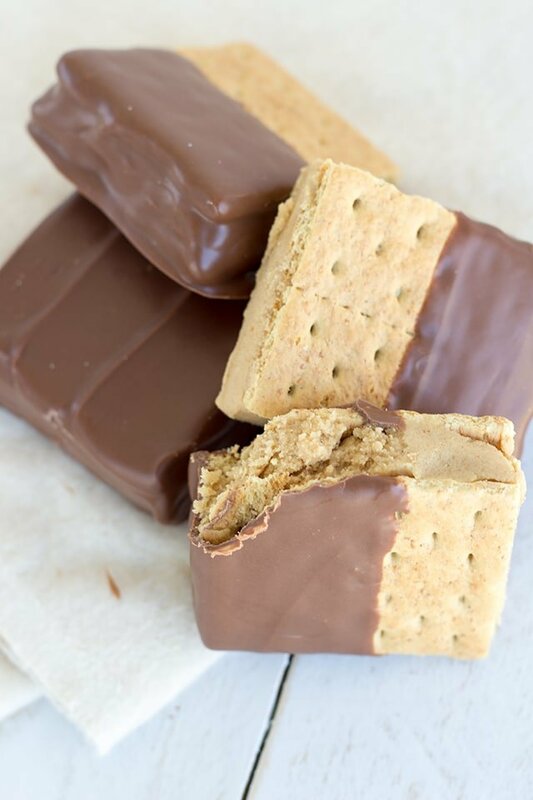 Graham crackers go perfect with so many things, a person would be crazy to not be addicted to them! Saw these on foodgawker this morning and they stopped me dead in my tracks! So clever. I love this mash up. Beautiful photos. 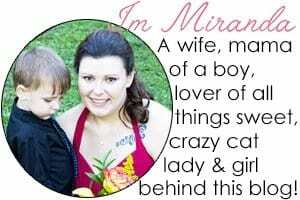 So happy I found your site.